UltraZone® UV-C + OZONE SPA SANITISER uses natural processes to provide crystal clear, clean and healthy spa water that looks, feels and smells just like nature intended. 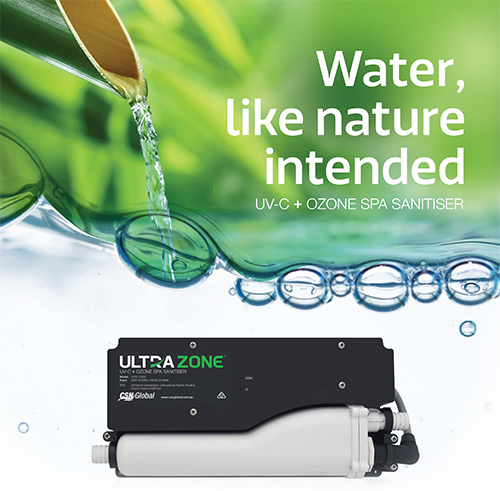 Using innovative technologies, the UltraZone® combines Ozone generation with UV-C sterilisation to make your spa water safe and clean whilst reducing your normal sanitiser usage by up to 70%*. UltraZone® UV disinfection is much more effective than chlorine in killing Giardia, Noro Virus, Crypto and is proven to control and remove unwanted chloramines. UltraZone® units are an easy retro-fit for new or existing spas. Simple to install, economical to run, better for your health. *Some sanitiser still needs to be used to maintain a residual and for shock treatments.